These files are sufficient to completely backup a BAScontrol project without the need of a Sedona tool such as Sedona Application Editor or Workbench AX. The BASbackup program is applicable to all models in the BAScontrol20 and BAScontrol22 series. When a Sedona project is stored, the controller's IP address settings and BACnet device settings are stored in one backup zip file. This way every controller on the job has a unique backup copy. From this one file, it is possible to clone other BAScontrollers with the same Sedona application files but with unique IP addressing and BACnet device configurations. During the process, BASbackup makes individual backup files for all the cloned controllers. Archive copies of each installed BAScontroller on a job site fully documents the project and makes individual controller restorations simple and fool proof. 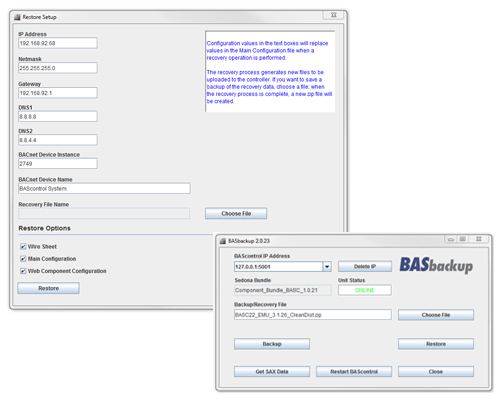 BASbackup is available by download with SAE and BASemulator as a single install. To download, go to the BAScontrol Toolset product page and login or create an account.